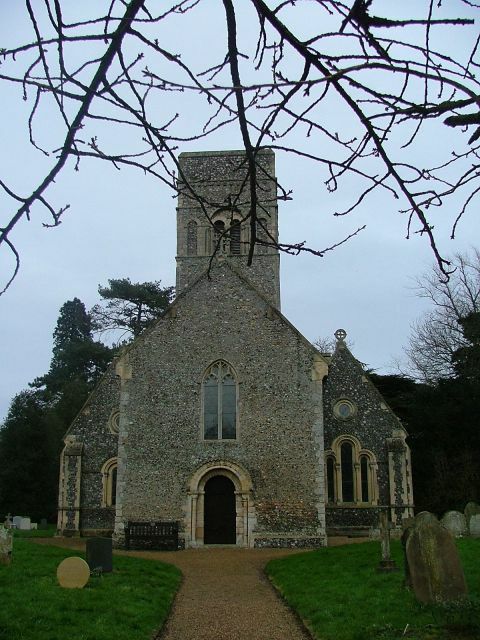 Gillingham has three churches, all in a line, all cut off from their village by the busy Norwich to Beccles road. 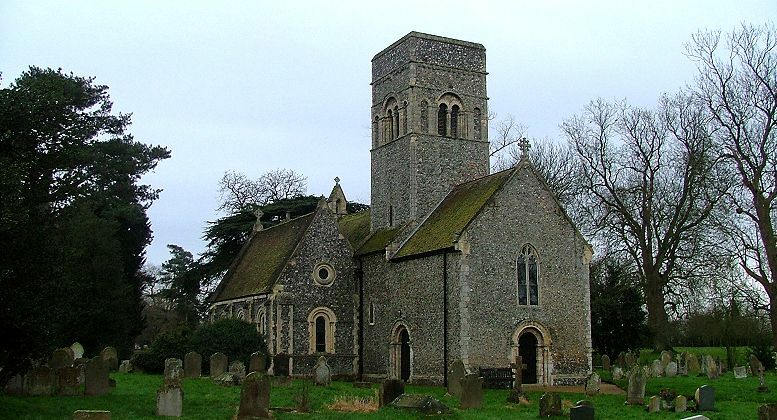 St Mary is the middle one, and is in many ways the most interesting; but the first time I came here, with Jacqueline, it was locked without a keyholder, and quite frankly at 4pm on a dank afternoon in mid-winter I was not surprised. For all I know, this place has a thriving spiritual life, and Gillingham is a pleasant, go-ahead little community full of goodwill and confidence in the future. But we couldn't have told. I came back with DD a few weeks later, and we were pottering about outside when a nice old gent with a patient dog approached us. "Can I help?" he said. Quickly, before DD could say something witty, I said "No thanks, we are just looking at the churches." "Right you are", he said, heading off; suddenly, he turned back, and added "did you want to take some photos inside? I've got the key in my pocket." 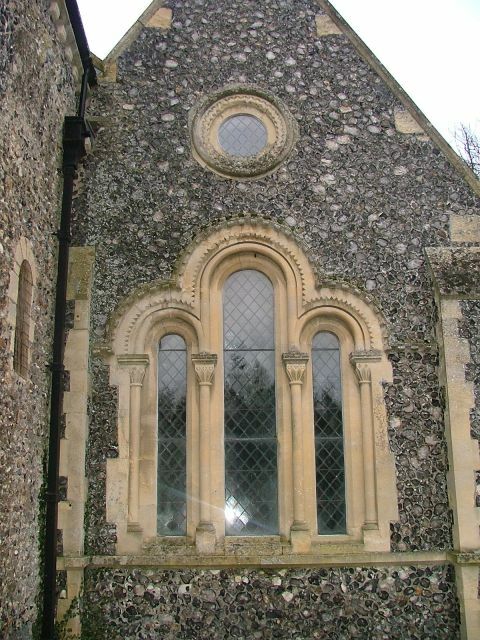 And so, we stood inside this most curious church , substantially the work of the Lowestoft architect Thomas Penrice. What you see in the photograph at the top is the west end. Pevsner (or at least, Bill WIlson) thinks that the tower and everything west of it is essentially original; me, I'm not so sure. If you look at the first thumbnail, you can see that the west wall at least is modern, and the south wall appears to be old, but truncated. 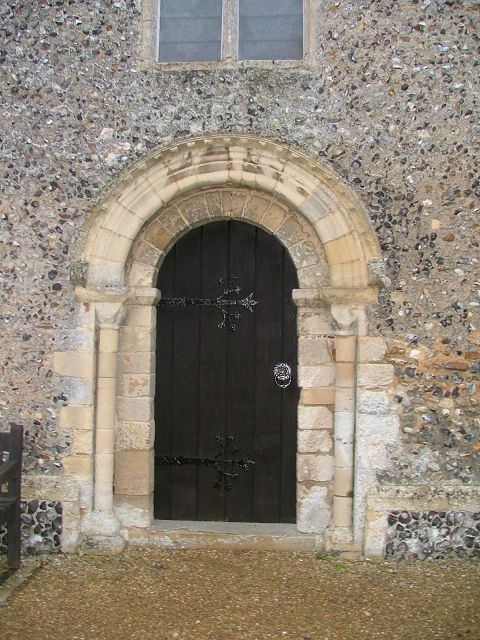 In which case the west doorway may have been moved eastwards. But there is no doubt that something drastic happened beyond. Penrice demolished the chancel and built a huge Romanesque nave, with a new chancel beyond and two massive flanking aisles. You step into the old bit, and it is all neat and plain, all very orderly. Curiously, the medieval roof survives above, and that it is truncated seems clearer. Even more curious, the roof of the new bit beyond the tower also appears to be medieval, although this may be a clever trick because the angels are certainly Victorian. I liked the ambience - 19th century Norman can be truly horrible, but this seemed to have a bit of life and character of its own, sort of camp romanesque. There's some decent glass, which helps - I liked Faith and Hope flanking the sanctuary, and the Kempe glass in the far west remembers the Vicar's wife and daughter who were drowned en route for Australia. The brass that Mortlock saw here 20 years ago has been stolen, and so the great treasure (and enormous rarity, as you'll see) is the section of medieval screen that hangs on the north wall of the old bit. The dedicatory inscription along the top to members of the Corder family is in English, and the beginning Pray for the Sowle of... has been scratched out by iconoclasts. Let's hope some museum doesn't get to hear about it. 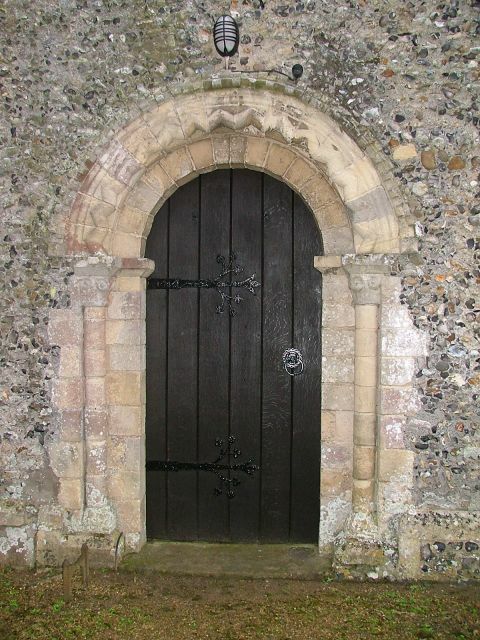 According to Pevsner, the external north and west doorways are original; Bill Wilson, in the new edition, mentions the west window of the south aisle, featured above. Tutting and shaking his head, he observes that it has so much nailhead ornament... one feels one could saw wood with it. Hardly approving, I'd say.